BIRMINGHAM, AL (WBRC) - Mostly clear and cool weather Friday night with lows in the lower 40s across much of the area. It will be cool for the Rumpshaker 5K at Regions and temperatures will initially be in the upper 30s and lower 40s but by 10 a.m. the air will warm into the 50s. Sunshine will be abundant once again and winds generally light from the northeast. The weather will be terrific in the afternoon do some something outside! High temperatures will be in the 70s. On Sunday, we will see more clouds moving in as our Next Big Thing gets closer. The rain holds off primarily until Monday but I can’t rule out a few showers by the evening hours across northwest Alabama. Temperatures will once again be slightly above normal. On Monday, some rain looks to arrive in the morning hours and more shower and storm development is possible during the afternoon and evening hours. I still don’t see a threat for severe storms and overall rainfall amounts don’t look excessive and will range from a tenth of an inch to a half an inch. 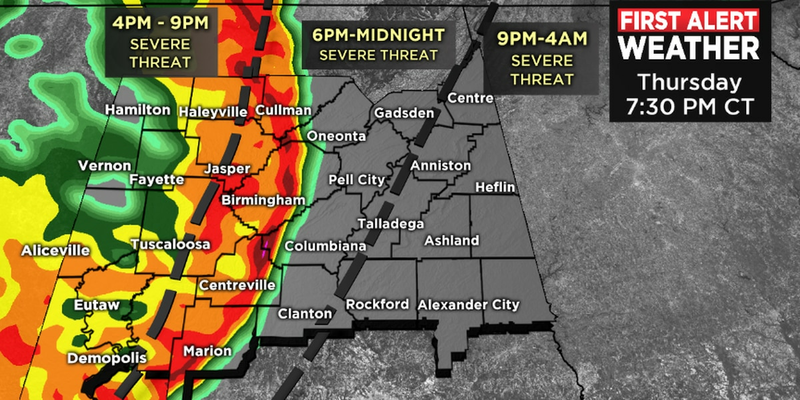 We’ll have updates on the WBRC First Alert Weather app. Cooler air and breezy conditions set in on Tuesday and rain chances dwindle. Temperatures will be back below normal and in the lower 60s. Temperatures do look to moderate slowly the rest of the week and rain chances look low at this time. Keep up with the timing of rain for Monday via the WBRC First Alert Weather app. We have declared Thursday a First Alert Weather Day for the potential to see strong and severe storms capable of producing damaging winds and isolated tornadoes.